My first pack pick of the week has to be my Atmos. I carried this bad boy 2,200 miles on the Appalachian Trail and it did its job amazingly. It comes in 50 and 65 liter sizes, but I chose the smaller one because I didn’t want to pack too much gear for my hike. The smaller the pack, the less you carry and the less you carry, the lighter your pack! This dude has some great features, but the three that stand out to me most are the Stow-on-the-go trekking pole attachment, the removable top lid, and the Anti-Gravity suspension system. 1. Stow-on-the-go trekking pole attachment is really handy. On the Appalachian Trail, or any trail for that matter, trekking poles are sometimes absolutely necessary for short sections. Having the ability to stick them on the side of the pack without having to take it off is super convenient. There are two loops you slide them through, sort of like a sheath. Then, when you need them back, you just whipped those puppies out! 2. The removable top lid might not sound very intriguing, but I assure you it has its uses. By taking the top lid off my pack, I was able to have a portable pouch for organization, a pillow, a seat, and it allowed me to synch my pack down smaller. Basically, you don’t have to take it off, but having the option to do so is totally worth it. 3. Anti-Gravity (AG) is an awesome new suspension system that Osprey designed. It is referring to the back mesh panel that keeps the pack lifted to allow airflow. Almost every pack has something like this, but what makes the AG special is the fact that the elevated back panel wraps around the hip belt, keeping more of the pack off your back and transferring the weight to your legs. Thirty pounds in this backpack carries quite a bit lighter than most other packs. When people come into my store looking for a hiking pack, the AG is the first one I recommend. 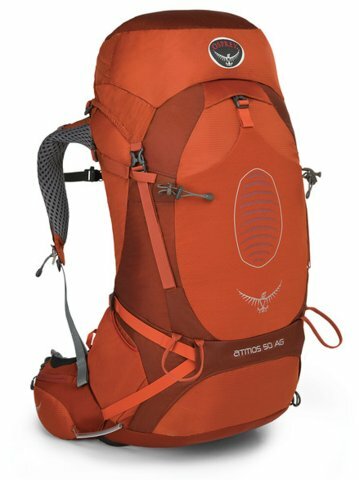 Wether you are going on a 20 mile or a 2,000 mile hike, the Atmos AG is the go-to rig. Every feature was designed with the hiker in mind. Hiking is rough enough as it is, but having that extra bit of comfort on your back can add loads of enjoyment to your time exploring this beautiful world.